Kyle Kirkwood clinched the Formula 4 United States Championship title when the series supported the World Endurance Championship and World Series Formula V8 3.5 at the Circuit of the Americas in Austin. Third in the inaugural season won by Cameron Das, Kirkwood teamed up with successful Road to Indy outfit Cape Motorsports for 2017 and moved ahead in the title race with hat-tricks at Indianapolis in June and Mosport in July. 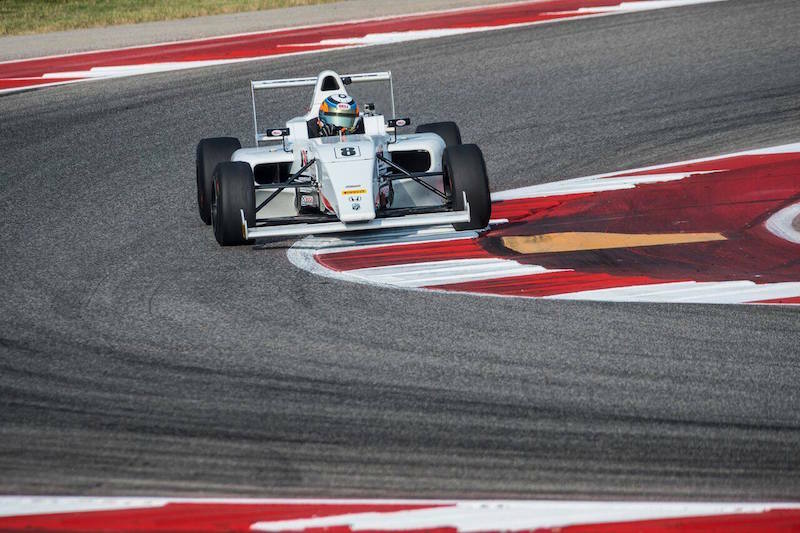 After further wins at both Mid-Ohio and Virginia, a second place in the first of the three races at Austin was enough for 18-year-old Kirkwood to clinch the crown before the series supports Formula 1 at the same venue next month. His success comes after fellow Cape driver Oliver Askew won this year’s USF2000 title. Both hail from Jupiter, Florida, and were chosen as the winners of the long-running Team USA Scholarship scheme last year. Seattle-based Dane Benjamin Pedersen was the star of the round, claiming his first two victories in the opening two races after pipping Dakota Dickerson to top qualifying by 0.022 seconds. Dickerson got ahead on the first lap of the opening race, but Pedersen got back past before the end, and Kirkwood and Braden Eves also moved ahead of Dickerson to complete the podium. Eves won a battle with Kirkwood for second place in race two, which Pederson led either side of a red flag after a bizarre incident in which a school bus entered the circuit during the race. In his second outing with Indy 500 driver Jay Howard’s development squad after two podiums at Indianapolis on his debut, Eves then overhauled the champion to win the finale. Pederson beat pole-sitter Dickerson to third. Kory Enders, who contested this year’s Toyota Racing Series, finished fourth in race two after starting on the front row in his second outing with the De Force Racing squad he has raced for in USF2000 this year. Regular TRS frontrunner Brendon Leitch has contesting his first campaign outside of New Zealand in the series this year and achieved a win, a second and third place at Mid-Ohio, though had to settle for a best of ninth at Austin. Canadian Raphael Forcier was Kirkwood’s closest points rival coming into the weekend having enjoyed a consistent campaign since taking a win on the opening weekend at Homestead, but he failed to score at all at Austin where a 32-car grid contested the races. Championship organisers have revealed plans to add a Formula 3 Americas series with a similar combination of an Onroak-built Ligier Crawford chassis and engines from Honda Performance Development. More details of the series, which appears to fall in line with the FIA’s concept for Regional F3 series that would fit between F4 and International F3, will be revealed over the United States Grand Prix weekend.